Often found on the Skedaddle picnic table beetroots are great for more than just turning your wee pink. Regular beetroot juice has been shown to have a remarkable effect on cyclists, it enhances blood flow, increases muscle efficiency and extends your endurance. Drinking beetroot juice can make you faster in a 10km time trial, it may only be by 12 seconds but that is enough to win a medal instead of being a runner-up. Pretty impressive for a root vegetable. To get the effect you need half a litre of beetroot juice a day, more than most of us would normally choose to consume, so for performance benefits professional athletes have concentrated shots. If you aren’t gunning for an Olympic medal just having beetroot in your salad still has many health benefits including reducing blood pressure and strengthening your gut health. Nature’s own energy bars. High in carbohydrate, easy to eat and digest, plus they come in their own handy packaging that doesn’t create waste or damage the environment. 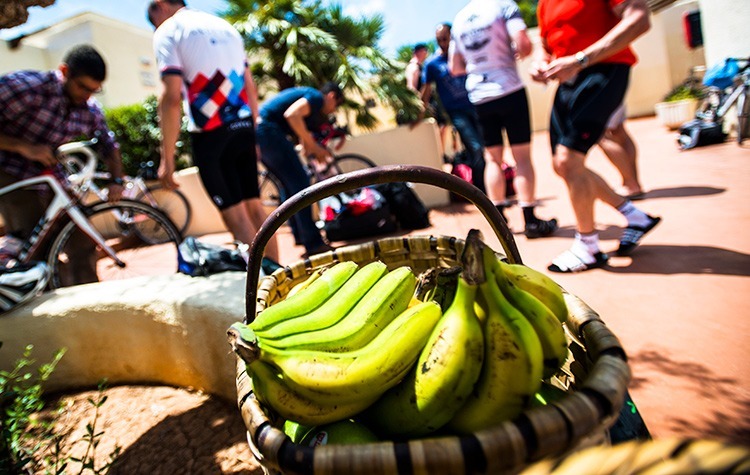 Bananas are the number one cycling food. They are perfectly balanced to replace the electrolytes lost through sweat, particularly potassium as well as providing 25g-30g of carbohydrate to supply energy to our cycling muscles. Bananas are interesting in many ways, their GI (how quickly the sugar in the food absorbs into our blood stream) changes as they ripen. A green banana is more fibrous and has a lower GI, a brown banana has a much higher GI so releases its energy faster. Bananas are good for long rides and eating before a ride as other than the very brown ones they reduce energy steadily over time. Don’t just eat bananas on your bike, the fibre in bananas called pectin helps to moderate your blood sugar levels and can reduce your appetite, making them a good snack between meals. They also make a great recovery food for after a ride, add them to a smoothie or eat one with a glass of milk. Not strictly a food but we can’t ignore the huge benefits, and pleasures, of a pre ride espresso. We all know a coffee helps us get going in the morning and keeps us awake when we are nodding off but when it comes to riding bikes it does even more. It increases alertness, as we know, but it also reduces perception of fatigue and discomfort. We feel less tired and cycling feels easier when we have had a coffee! 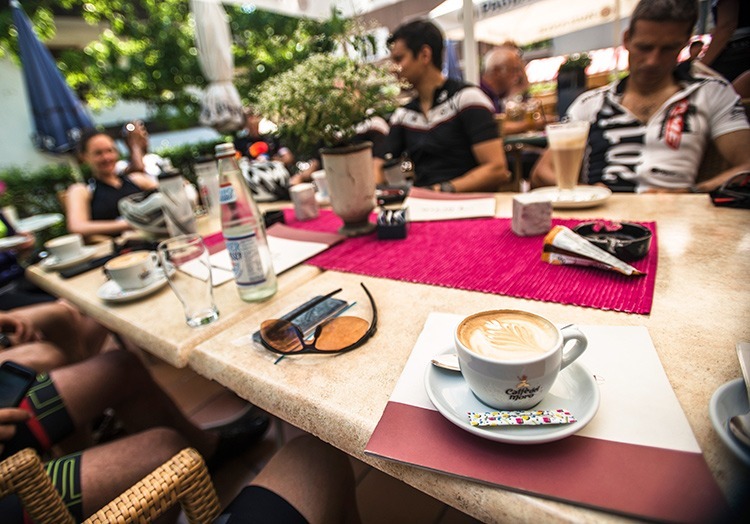 Over time our bodies can get used to the amount of caffeine we are using so to get a more effective coffee hit while cycling keeps your espresso habit for pre-ride treats and the café stop. Dates are the natural fruit equivalent of scoffing Haribo or eating gels. They are incredibly sweet as they are 80% sugar so they fill your mouth with the sweet sticky sensation we sometimes crave and provide the carbohydrates you need for cycling. But unlike eating sugary sweets they also pack a high number of nutrients for good health. As with bananas they are high in potassium, also magnesium and copper which help to maintain a healthy nervous system and blood pressure. The sugar in dates is usually glucose, fructose and traces of sucrose and maltose providing you get a quick burst of energy and also a slow release over an extended period of time. They are great for satisfying a sweet tooth when not cycling as the fibre in Medjool dates slows the rate at which the carbs can be digested, so you avoid spikes in blood sugar levels and energy remains more constant. You only need one or two dates at a time as they are so intensely sweet and energy dense. 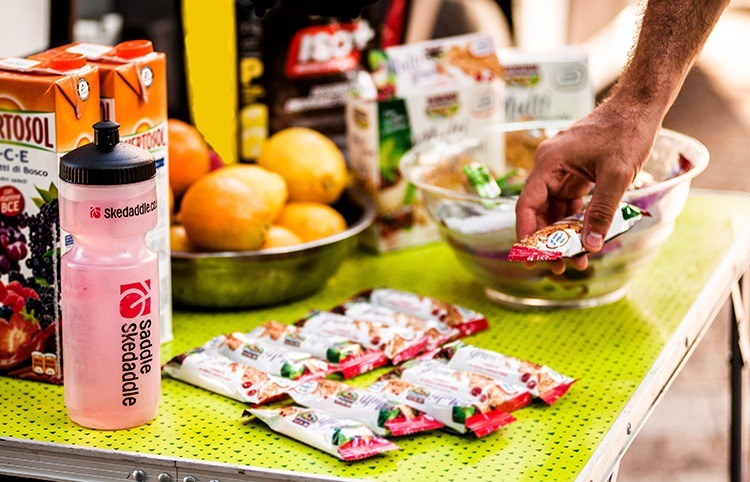 After cycling, particularly if you are on a long trip and need to cycle again the next day, you need the right foods to help your body recover. The two priorities are carbohydrate and protein. There has been a lot of noise about why chocolate milk is the ultimate recovery drink, it contains a three-to-one ratio of carbohydrate grams to protein grams which appears to quickly replenish your body’s energy stores, as well as potassium, calcium and vitamin D. Chocolate milk is easy to digest ( for those who normally eat dairy) and it contains exactly the right balance of fast-absorbing proteins from the milk, such as whey protein for muscle growth and repair, and slow-absorbing proteins such as casein which gives your body protein building blocks to keep repairing over time. However, these facts also apply to that holiday favourite – ice-cream – and what better way to round off a day in the saddle than licking a lovely big cone of your favourite flavour. Ice-cream slips down easily, even if you are feeling hot and tired at the end of the day, and helps give your body the fuel it needs without making you feel uncomfortably full.